We have an outstanding selection of replacement parts available for Jotul Stoves. We have Blowers & Motors, Catalytic Combustors, Electrical, Gasket, Grates, Liners, and much more! 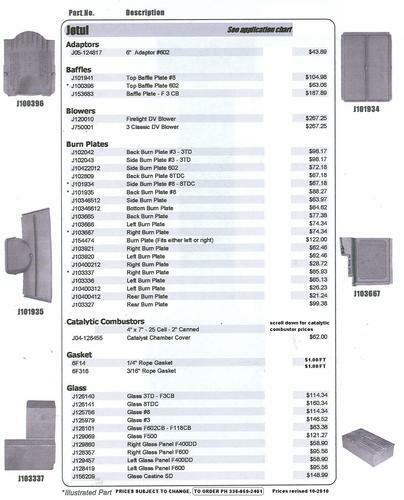 Jotul Parts available on lists below (click to enlarge) We have many parts available that are not shown below. Call or email for details! CATALYTIC COMBUSTORS WITH A 5 YEAR LIMITED WARRANTY. 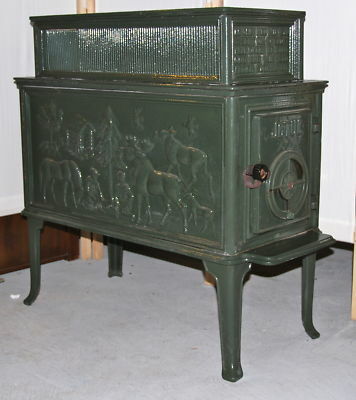 We have parts available for most stoves! 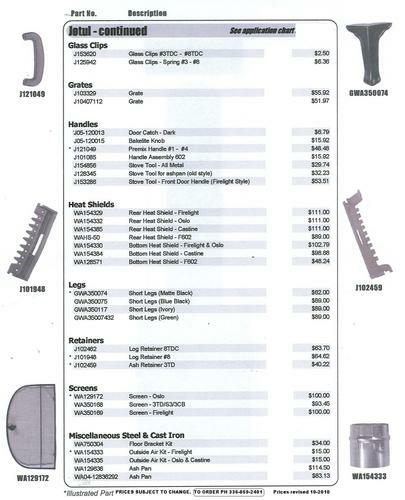 If you can't find a part you are looking for please call or email us! Abraham, Acorn, Ajax, Alaska, Allnighter, Allstar MFG, American, American Eagle, American Furnace Company, American Road, American Seating,Americana, Andes, Appalachian, Argand, Armoral, Arrow, Ashley, Aspen, Atlanta, Autocrat, Avalon, B.K.,Bat Cave Stoves, Berkheimer, Berkshire, Better'n Ben, Big Ben, Big Jim's Woodstove, Birmingham Range, BIS, Blackhawk, Blaze King, Blue Ridge, Boss Stove, Boston Stove Company, Brown, Buchanan Welding, Buck Stoves, Buckeye, Buckner Enterprises,Bussy & McLeod Stove Company, C & D Enterprises, Caboose Stove, Cannon Stove, Carolina Stove, Catalytic Damper Corporation, Cawley-Lemay Stoves, Century, Chappee, Chehalem Fireside,Chippewa, Chubby, Citation/Salvo Machinery, Clarion/Wood Bishop, Clayton, Co-operative Foundry Company, Coalbrookdale Stove, Coalmaster, Cole's Heaters, Coleman, Comfort Flame, Comforter,Concord, Consolidated Dutchwest-Vermont Castings,Corinthian, Coronet, Cottage Stove, Country Comfort,Country Flame, Country Stove, Craft Stove, Crane,Crawford, Defiance Company, Derco Inc., Desa, Design Dynamics, Detroit Stove Works, Devault-Fab, Dexter Stoves, Dixie, DK Metals, Dockash, Dominion,Doorwood, Dove, Dover, Drolet, Duomatic-Olsen, Eagle Furnance, Earth Stove, Efel, Elm, Elmira,Enerex, Energy Harvester, Energy King, Energy Marketing Corp., Energy Mate, England Stove Works,Englander, E-Z Insert, Enterprise, Estate Eureka,Euro-Design, Excaliber, Faultless Oak, Favorite, Fawcett, Fern, Fire Chief, Fireplace Xtrordinair, Firepower Add-on Furnace, Firerite, Fisher, Fjord, Florence, FMI Fireplace, Foundry, Fuller & Warren Co., Garrison, Georgetowne Stoves, Gibraltar, Glacier Bay, Glenwood, Globe, Godin, Gold Coin, Golden Oak,Greenhorizons Furnaces, Grimstock, H.B. Smith Coal Boiler, Haas Sohn, Hampton, Hardy Outside Furnace, Harmon, Heart Fireplace, Hawke, Hayes Equipment, Hearth Heat, Hearth Mate, Hearthland, Hearthstone, Heating Energy, Hercules, Heritage, High Valley, Hitzer, Home Comfort, Home Heater, Homer, Homewood Furnace, Horstman Industries, Hotblast, Hoval Boiler, Hutch, International Heater, Jensen, Johnson Energy Systems, Jotul, Jumbo Stove, King, Kingsman, Nightingale, Knox Stove Works, Koser Northland, Kresno, Kuma Stove, Lake Region Stove Works, Lakewood Stove, Lancaster Fabrications, Lange, Lavec, Leaders, Lighthouse, Lilly Furnaces, Lilly Stoves, Locke Stoves, Long MFG, Longwood Furnace, Lopi, Loth, LTD Furnace, Magee,Magestic Range, Martin Industries, Mealmaster, Memco, Modern Maid, Mohawk Industries, Monarch, Morso, Mount Vernon Range, Napoleon, Nashua, National Steelcrafters, Nestor Martin, New Buck,Newmac, Nightingale, Northland, Novel, Novelty, New-Tec, Old Mill, Olix Air-Flow, Oregon Wood Stoves, Orley's, Orono, Orr Painter & Company,Orville Products/Country Comfort, Panda Stoves,Park Oak, Patriot, Penn Coal Stove, Perry Stove Company, Pettite Godin, Phillips & Clarke Company,Pine Baron Stove, Portland Stove Company, Pro-Former-Z, Rathbone Sard & Co., Rebel, Record Foundry, Red Cross, Regency, Reges Metal, Reginald, Rembrandt, Riteway, Round Oak, Royal Scott, RSF Energy, Rupp, Saey, Salvo Machinery,Scan, Scandia, Schooner, Scotia, Scranton Stove Works, Sears, Security, Shenandoah, Sierra, Silent Flame, Smith, Smoke Genie, Sotz, Splendid, Squire Stoves, Stanley Cook Stoves, Steel King Furnance, Stewart, Suburban, Summer Heat, Sunbeam, Sunshine, Superior Stove, Surdiac, Sweet Home,Tarm, Tempwood/Tempcoal, Thermograte, Timber Eze, Timber Ridge, Timberwolf, Tirolia, Torridaire,Trail Blazer, Travis Industries, Treasure, Treemont,Ultraburn, Universal C & S, Upland, US Stove Company, Van Wert MFG, Vansco, Vantage Hearth, Vermont Castings/Consolidated Dutchwest, Vermont Down Drafter, Vermont Iron, Vermont Soapstone, Versagrid Retrofits, Vestal, Viking, Vulcan, W.E.T. Industries, Warm Morning, Warnock Hersey,Waterford Stove, Webco Ind., Webster Stove Company, Welcome, Western Fab, Wier Stove Company, Wonderwood, Wondercoal, Wood Bishop, Wood Chief, Woodchuck, Woodmaster, Woodstock, Woodstocker, XTEC, Yukon...and more!! !